Fighting is not good and that’s what our elders keep telling us. But if you get a chance to see a fight, it at least should be decent. Now let me tell you how a fight is classified as decent. When we see at streets two young guns fighting over a pity issue, it scares us because they’re fighting like mad. One punch here, one kick there and sometimes even bites are involved (in case Luis Suarez is one of them). Such fights are gruesome and terrifying and not at all something that you’d pay for watching. But let’s take a look at WWE or movies where we have so many fights and it’s more appropriately termed as “action”. What’s the difference between the two? Well, there’s a big one and that’s of coordination. These fights are supervised and are certainly more entertaining. But if they’re so entertaining to watch, what would it be like to be a part of them! Shadow Fight 2 brings you a chance to live those moments from the centre of the stage. It’s a Windows app that has been developed by Nekki. The app is compatible with all the devices running Windows Phone 8 and 8.1. 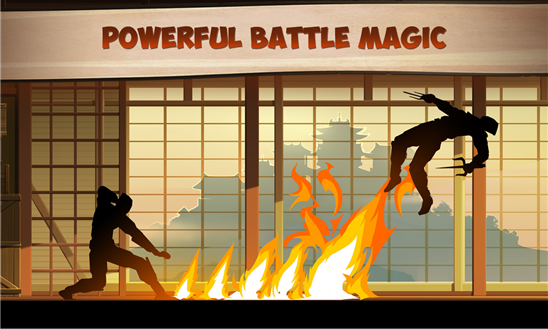 Shadow Fight 2 spoon-feeds you with action & glory just when you want it. You’re going to be a part of some epic battles that will decide your fate and of course, of your opponent’s. The fights are a mix of Martial arts and classic moves and every step you take counts in your win and responsible for your defeat. If you’re still standing on your feet, make way for the magic powers to tear you apart. It comes from nowhere and you can only feel destroying you from the inside; your health meter will show you that. The only ray of hope that remains with you in such a dark hypnotic time is a weapon that you can strike so hard that it will rip your opponent into halves. Thankfully, there are many such weapons to unlock to give you an upper hand. In every level, you’re on a manhunt and as soon as you finish it, the next mission is served on your plate. There are so many such levels and you must maintain your potential throughout. The visuals of this game are just stunning and take a huge leap than other combat games you might have played before. 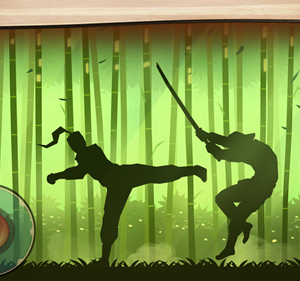 Shadow martial art is a very thoughtful concept of showing the qualities by hiding the details and it works very well. The animations support the delicate graphics and these are the pillars that make this app stand out in the crowd. 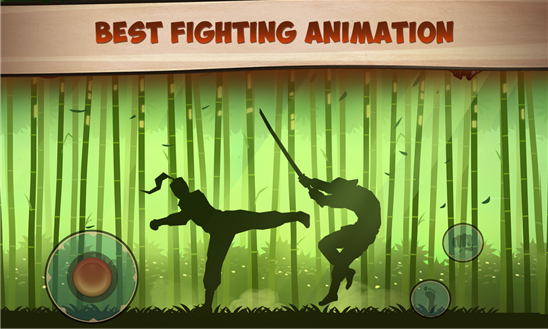 Shadow Fight 2 is a must have app if you love action and are willing to be a part of it. The app is available for free in the Windows Phone Store. So don’t forget to check it out today! Pros: stunning visuals; lots of weapons to unlock; magic powers; challenging levels of gameplay; free.